Shueisha put out a notice today that due to the “flood of preorders” (their exact wording) for the Masakazu Katsura illustration book + Wild Tiger figure they had to set a deadline. Any orders made after July 22, 18:00 JST will not be accepted. And that point of time has passed already, so if you managed to order it, congrats. We’re actually not sure what’s going on anymore. I’ve never been into a series where the merchandise sells this quickly. I didn’t expect the book+figure set to go so fast because it was a bit on the expensive side. And I really wanted to preorder this myself, too, but the price with shipping was just too high for my current financial situation. Update: Not sure how legit this is, but Go Inoue tweeted some stuff that sounded like they were going to make the book+figure sets to order, but they were getting more orders than they expected and that’s why the deadline was set. Take this with a grain of salt, we have no further confirmation. Update August 22: The artbook + figure set release date has been pushed back to February 10, 2012. 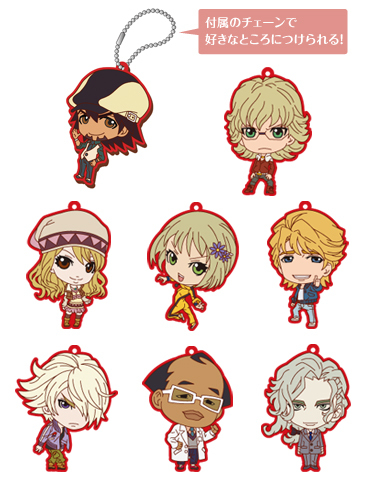 The rubber charm set that was on display at the Tamashii Festival was added to the Tiger & Bunny lineup at the Tamashii website. Release date and price aren’t determined yet. The set has eight charms, 6 cm tall. Summarized TL from the description on the product page: Kotetsu, Barnaby, Karina, Ivan and Paolin are doing the same poses as on the BD Limited Edition jackets. (Paolin’s design was still in progress so they used photos of the sketches by Masakazu Katsura as the base for her charm.) Keith and Yuri are doing their poses from the 2nd OP stills. And then there’s Doc Saito as the highlight of the set! Waaa… ya ni llorar es bueno… hehehe… I’m happy this series is a success but by the other side i’m sad I ain’t able to get something T_T … it goes too fast! I think everyone’s feeling like that right now. Everywhere I look there’s stuff that’s sold out already on preorders.